It's certainly understandable that the charedi community has great hostility towards Rabbi Dov Lipman. Unfortunately, that appears to have translated into a declaration of open season upon him - including interpreting his statements in the most negative way possible, and outright lies about his activities. A while ago, we had Rav Aharon Feldman condemn Lipman as a rasha. He subsequently sort-of apologized, saying that he had since learned that Lipman truly believes that he is doing the right thing in trying to get charedim to receive a minimal secular education, and is not acting out of wickedness. But why couldn't he figure this out in the first place? Even a minimal amount of research on Dov Lipman reveals that he is a very idealistic person, who puts himself out to improve society. And is it so unthinkable that a person might, for altruistic reasons, want charedim to be able to support their families? But the real nasty hatchet job on Lipman was performed by Jonathan Rosenblum in Yated last week. Rosenblum began by referring to Lipman's famous/infamous remark upon seeing an elderly street cleaner - “Why couldn’t a yeshiva student be doing that?” Rosenblum presented this as an example of contempt for Torah learning. Now, for the record, I think that it was a huge mistake for Lipman to say what he said. But is there really no possible interpretation other than that it reflects contempt for Torah learning? It couldn't be that Lipman simply feels that yeshivah students, instead of focusing only on Gemara, could also work on chessed projects? In one charedi yeshivah where I spent many formative years, the emphasis was only on Gemara, to the extent that when a badly handicapped person in the neighborhood needed daily assistance, some "top bochrim" refused to help, saying that it was "bittul Torah" and best performed by lesser students. Conversely, the wonderful yeshivah where I teach part-time, Lev HaTorah, strongly encourages all students to take on chessed projects for the community, as part of becoming better Jews. Does this mean that they have "contempt for Torah"? Of course not. And why not assume the same for Lipman, who, as someone who spent most of his career as a yeshivah rebbe (and himself volunteered for street cleaning), clearly does not have "contempt for Torah"! "Lipman is seen leading a woman whose attire was guaranteed to provoke an angry response past a shul in the “Yerushalmi” neighborhood of Ramat Beit Shemesh. Just in case she failed in her task, he thrust his arms triumphantly in the air numerous times to provoke the desired response for this bit of filmed street theater." What a sneaky, dishonest account. The distortions are so densely packed into this that it has to be fisked. Let's first discuss the description of the woman wearing "attire guaranteed to provoke an angry response." He gives the impression that she was wearing a halter top and shorts. In fact, she had sleeves (albeit above the elbow), a long skirt, and her hair was covered (albeit only with a hat). This is exactly how many women in the neighborhood dress, especially on that street, where they have lived for many years, before any Yerushalmis moved into the neighborhood. More to the point, Lipman was not "leading" her "past a shul" in a "Yerushalmi neighborhood" in a provocative act of "street theater" with the "task" of provoking an angry response. I happen to live just a few minutes away, so I know the facts. Walking along this street is something that dati-leumi residents have been doing for over fifteen years, long before any charedim moved in to the area. Unfortunately, when their school (which had been planned for years) was opened, certain charedi residents (who had only recently moved in) decided that it was their turf, and harassed dati-leumi people walking past, including children. (Similar harassment of children has occurred in my own neighborhood.) And so many dati-leumi people decided to walk along that road - in their own neighborhood - to make it clear that they would not tolerate this kind of intimidation of children. And it wasn't a performance for "filmed street theater" - it just happened that one of the local residents involved in the daily walk spontaneously decided to show the world what happens here on a regular basis. It wasn't "provoking" anything - the charedim were out there yelling even before Lipman arrived on the scene. As for Lipman thrusting his arms into the air - how on earth does Rosenblum know that this was to provoke a desired response? Is he a mind-reader? Maybe it was a reaction to an approaching hostile group, to show that he wasn't intimidated? Maybe it was a nervous or quasi-playful gesture, to make light of their insults and curses? Why does Rosenblum feel an obligation to judge it in the worst possible light? And for all Rosenblum's condemnation of "provocations" and his dismissal of Lipman as a peacemaker, with Rosenblum claiming that the problem had already been largely resolved, the facts are otherwise. The chareidi mayor of Bet Shemesh was all for giving in to the zealots and removing the school from the dati-leumi population that it had been promised for. The only reason why the dati-leumi community was able to keep their school - and that the protests eventually died down - was that they took a strong stand and did not give in to intimidation. Amazingly, Rosenblum says in this very article that people should only have opinions on matters when they are intimately familiar with the local situation. (Yes, I am aware of the irony of that position being stated in a publication that idolizes Gedolim who are famous for giving rulings for situations of which they have no knowledge.) Why doesn't that apply to him? Rosenblum's main point is that the RCA should not have Lipman speak at their convention, due to guilt by association. But if he believes in guilt by association, and he's writing in Yated, then why doesn't he mention anything about the Satmar rally, featured in the same issue, in which Lithuanian Gedolim sat at a dais where speakers described Israel as an "evil regime," and talking about how “the very existence of the state is a rebellion against God” and about how “the [Israeli] army was founded on murder and blood spilling”? It reminds me of the time that Rosenblum was speaking to a secular audience about the ban on my books. He did not reveal that the Gedolim insist that the world is a few thousand years old, that the Sages of the Talmud were scientifically infallible, and that the rationalist approach of the Rishonim is forbidden and/or heretical. Instead, Rosenblum launched a personal attack on me - as if my personality was the issue at stake. Even Rosenblum himself agrees that the charedi community in Israel has a huge problem with mass kollel and underemployment, describing kollel as "chemotherapy". And not everyone will agree with his spin about how the Gedolim secretly agree with him. The charedi community is taking steps to deal with it; but many people see these as relatively miniscule, painfully slow, and woefully inadequate. It may - may - be strategically unwise for the government to force the issue, but it's not evil or anti-Torah. Slandering people, on the other hand, is most certainly evil and anti-Torah. Good article. Very sad. No question that Jonathan Rosenblum is a very talented man, by many accounts a very decent person, and a very skilled apologist for the haredi world. But I believe he is trying to straddle two worlds that have grown too far apart to be reconciled. I don't think it is possible to maintain an intellectually honest discussion on the terms of western intellectual discourse, which is what I believe Jonathan Rosenblum attempts to do, and still maintain loyalty to the gedolim, as the haredi world defines the term. Someone like Jonathan Rosenblum who attempts to do this will be undercut, time and time again, by the very words of these "gedolim", such as the latest ugly attack on Rav Stav by Rav Ovadiah Yossef. The routine name calling by the "gedolim" and their political respresentives against those that oppose their world view, no matter how respectfully, cannot be reconciled with the calls for mutual respect that are issued by apologists such as Jonathan Rosenblum when they try to convince the non-haredi world to accord the haredi world respect that the haredi world does not in any way reciprocate. Or, as in this case, he will attack the man who spoke out against real evil in our city, while the rabbis in the "gedolim" camp to which Jonathan Rosenblum belongs showed much more anger about the media presence and Dov Lipman than about the ugly behavior that led to the media presence and gave Dov Lipman the opportunity to step up and be a man when there weren't any other men. Golly, if you would be dan lekaf zchus Torah leaders in the same way as you do to Lipman, people would start taking you more seriously. Presently, mature jews know you as a letz and not even worthy of a response. "Sleeves albeit above the elbow"
Rabbi, in Aish they taught from the Torah halacha perspective sleeves above the elbow is just as forbidden as a mini-skirt. You seem to downplay that. Thanks for giving over moderate view. "Golly, if you would be dan lekaf zchus Torah leaders"
I already do. The best defense of the Gedolims' ban on my books was written by me. You're confusing disagreement with judging unfavorably. "people would start taking you more seriously." People already do take me seriously. That's why they feel a need to condemn my blog in Agudah conventions, etc. But you're right that in order to actually speak there, I'd have to completely ignore any wrongdoings by Charedi Gedolim. "Presently, mature jews know you as a letz and not even worthy of a response." Look at the Mishpacha article on the same topic by Jonathan Rosenblum. He writes completely differently than in the Yated article. I believe that he was asked by the Yated to write a column and he adapted his views to the readers. You do what the customer has ordered. I personally have no doubt that Rabbi Lipman started out L'Sheim Shamayim and was completely correct in defending against the excesses of the Fanatics. But I equally have no doubt that knowingly or not, he has turned the corner and has said and done things that are simply wrong. He has made ridiculous comments about the standard Halachic position of Tznius (that women have no obligation to dress modestly at all, all is up to men), about the nature of Hasmada in Torah (that it is not normal) about the value of Gemara, etc. All of them he possibly could defend, some he backtracked, but the bottom line is that he now comes across as a politician with an agenda, and one that has joined with forces that really aren't his values and now is the useful idiot used as the Black Kippah wearing guy to bash the Chareidim. He also comes across as extremely condescending and know it all, and in the process has shown true ignorance. No doubt he has been "pushed" into some of these positions, but anyone remotely objective and Rational will see that he is no longer the pure defender of the faith, and should not be anyone's poster child for Torah values. He actually reminds me of someone else who started out completely L'Sheim Shamayim and who anyone Rational or objective would see no longer is. His name is Rabbi Nosson/Natan Slifkin. This is written by someone who still admires both of them. But I really wish they both would look into the mirror and see what the Chareidim have sadly forced them to become. Of course I have a chip on my shoulder. But that doesn't invalidate my positions! Since your impression of Dov Lipman probably comes largely from the charedi press, I doubt that you have an accurate picture of him. By the way, Dov Lipman's statements about the study of Gemara, which you consider "ridiculous" and "ignorant", were also the views of Rishonim such as Ibn Ezra (and probably Rambam too). Rabbi Slifkin -- you are just making my point. I am VERY well aware that those positions are of certain Rishonim. But for him to use those positions, which were absolutely not those of the Yeshivos that he learned in, almost certainly not the positions he previously held, are not the positions of the Chareidim which he claims to be one of (are also not the position of the MO/YU World as expressed by RYBS and others),not mainstream for many years, IS ridiculous. It adds nothing useful to the debate and adds zero legitimacy to his argument. He has turned from a well meaning, nice, American Ner Yisroel type Yeshiva guy (which is to be admired in the correct time and place), doing good things, into a demogouge. And any Rational person knows that having a Chip on your shoulder DOES make you less Rational (Rambam writes that in various places). So yes, it DOES (somewhat) invalidate your positions and DOES cloud your ability (and his) to think Rationally and clearly. This is a completely Rational statement -- it is almost impossible to be otherwise. As I said, I still respect and learn much from both of you (more from you -- he really doesn't across as much of a Scholar), but I still say it is sad what you both have become. And I do NOT get my information only from the Charedi press -- stop buying into all the propaganda and try to rid of the Chip and you will see that (much like his street cleaner statement that you agree wasn't wise) he (and you) are being forced into places you shouldn't have to go. Clouding one's ability to think clearly does not necessarily mean that what is being said is wrong. After all, most religious people are biased in favor of religion - do you think that this means that their opinions on religious matters are wrong? Lipman is part of Yesh Atid and has been involved in a party and he himself has advocated policies that are anti-Torah. How any Religious Jew or any Jew can support him and that party is beyond belief. How can someone be called a "Rabbi" while advocating things against the Torah? you have to choose the laws of man or the laws of G-D? It does not "necessarily" mean that it is wrong, but absolutely mean that it is more likely that they are. Like I said, this is all very basic stuff -- points made by the very Rationalist Rishonim you frequently quote. Everyone has certain bias that is the framework that they operate in. The question is not of bias, but if within that framework they are thinking clearly and rationally. A "Chip on shoulder," anger, excessive passion, lust, bribe of honor or money, all make one not able to think as clearly as they would without having them. Of course you know all this to be true and know exactly what I am saying. And you know that your point adds nothing substantive. In fact, I am sure you could make my point far more eloquently than I could. Which is exactly what bothers me -- don't become a demogouge and argue against things that you yourself (in objective moments) know to be true. Like I said, I liked R' Lipman and liked what he was trying to do. But anyone objective knows that he has veered (pretty far) off course. "It does not "necessarily" mean that it is wrong, but absolutely mean that it is more likely that they are." Absolutely not! The fact that someone has a heavy bias, anger, etc. does not make it MORE likely that they are wrong! There are people with a heavy bias/ anger *against* Dov Lipman. There are people with a heavy bias for, or against, religion. Does this make it more likely that they are wrong? I ignore all of Rosenblum's op eds. I came to the conclusion a few years ago that he doesn't believe most of what he writes. There are things that I can agree with Dov Lipman, such as promoting more of the American Charedi model of secular studies in high school, and reminding people that they must support themselves. Still, some criticism of Dov Lipman is fair game. For example Lipman has said a few things which strike me as outside of Orthodox Judaism. 1. He thinks that a statement that a secular judge is passul le'edut is extremism. I disagree. If one who brings a civil suite before a secular court is "raising his hand against the Torah of Moshe Rabbenu," then one who judges it is no different. 2. He has stated that there is no Biblical requirement of tzniut, only that men shouldn't look. He reexplained himself on facebook, but in that radio interview, it didn't sound that way (some halachot are Deoraita). I am disagree with a few other statements that he has made, and there are also more that are more political (I don't like his Jewish-Democracy hybrid). Religious criticism is religious in nature. Not every opinion is going to be tolerated, you'd be hard pressed if you tried to prove that Hazal, or the Rambam were tolerant in their religious views. Calling one out on what one believes is heresy, or rish'ut should not be considered hatred. So, without being full of hatred, I believe that Dov Lipman has removed himself from the Law. Rambam and many others say it clouds your ability to think. Clouding your ability to think makes your conclusions less likely to be correct. Of course those who have heavy anger against Rabbi Lipman, or feel it will affect their positions, finances, lifestyle, etc. are more likely to be wrong about him. That is EXACTLY what is happening. My point is only that the passions on the other side are not letting him be judged objectively either. "less likely to be correct" is not the same as "more likely to be incorrect than correct"! R Slifkin, i enjoy your viewpoint and blog immensely, but i noticed your reference to a "chareidi" yeshiva you spent time in where the top people denigrated helping a handicapped person, and i think i know where you are referring to (i spent several years learning in a yeshiva with a program called Chessed LeAvraham to help a handicapped man in a powered wheelchair go to the bathroom/get ready for bed etc.). I know you went there too for a time, but at least when i was there (2000-2004) the top people were all very involved, including the holiest few guys in yeshiva essentially running the program (until it ended for reasons i need not go into). sure there are some self-entitled lowlives who refuse to get their hands dirty in the name of torah, but those guys fizzle out and never become anything. wouldn't see them as "top bochrim", kind of an oxymoron. Yitzi7 - Whilst you are of course correct, sometimes it takes people with an axe to grind to get the job done. The Israeli Charedi system is an ongoing human tragedy of immense proportions. If it takes someone with Lipman's hashkofos to sort it out, then so be it. Alan - Good by me, just we shouldn't make believe he is something that he is not. But more fundamentally, I fear the reverse is true. Someone like him causes them to be buckle down and oppose all change, even things that were already started to put in place. His statements and actions cause complete distrust. An insider could achieve much more. This man's previously held esteem for Rabbi Rosenblum has plunged and splattered on the floor into an unrecoverable mess after reading the Yated article with its finger pointing and de rigueur Korach comparison. For next to the video link on the YouTube page one may witness the context in the other videos, those of the Hareidi men mobbing school children on their way out of school. That, without too many words, presents the most salient context to this strife. The distress, with grimaces of fear and hand-wringing on some of the little munchkins is painful to watch. It obliterates all other issues. What will be the "butterfly effect" on the psyche of a child subjected to such an outrage be? Should not this alarming issue, rather than musings over definitions of tznius be at the forefront of the discussion? Is this not a living warning of how a detached, cloistered life focussed on a pure diet of books and an absence of sensible and responsible leaders can skew one's sense of reality and perspective and leech out basic feelings of human compassion and a protective instinct, which even many animals experience in the proximity of their young? As a father of a young daughter, this man's blood seethes at such scenes. Adults who would engage in such disgusting obscenities like screaming and spitting at children are beyond the proverbial pale and not worthy of mention outside of criminology and psychopathology treatments. But the keepers of these hoodlums.... the parents, rabbis and sponsors.... who gloss over this elephant instead of dragging them off by their ears with kicks to their behinds, do deserve to be ridiculed, ignored and forgotten as well. Ditto for the gaggles of clever apologists who come out of the woodwork as night follows day on such occasions as this one, to scoff at and obscure the core issues with ad hominems and presumptions of angelic purity of motive for their side and character deficiencies of their opponents. Harrumph! Temujin is a sadly disappointed and angry Barbarian and will now go for a vigorous bike ride over muddy trails and through rain-swollen creeks to calm his temper and restore his usually peaceful and cheerful constitution. The issue is not Dov Lipman. Lipman most certainly snafued big time with his off base comments concerning the kotel and women. By doing so he allowed himself to become the straw man for the charedi media. Two tropes from the charedi world are emerging- "What Lipman said" and "We sort of agree with the government's agenda- but they are moving too fast and we would welcome any changes that are not actually imposed on us by coercion." The latter is most perplexing: not a day goes without hearing a charedi spokesperson wax on on how many charedim are studying in college or enlisting in the army. Give us more time, they write, and even more will do so. But if the gov't insists on a program that the charedi spokesmen agree is consistent with a Torah lifestyle, it suddenly becomes a cardinal sin. JR's sick accusation that gov't cuts are draconian should be shoved back in his face. It was OK for the charedi parties to allow the draconian destruction of Torah communities in Gaza- and thus destroy people's livelihood instantly. The UTJ stole other peoples livelihood as a fundraiser. The result? Hamas, missiles and further Palestinian intransigence. The result? The decimation of the Israeli left. The result? A broad gov't coalition with a rightist perspective on security that simply didn't need the charedi parties to counterweight a weakened left. The reason why the charedim have been left out in the cold is because they threw their brothers out of their homes. There are people with a heavy bias/ anger *against* Dov Lipman. There are people with a heavy bias for, or against, religion. Does this make it more likely that they are wrong?" You said that you will not debate people who are Chareidi and AntiEvolution because of their not wanting to abandon their belief, their bias. Now you argue you're passionate but still by your standards can meaningfully debate or do you argue no one should debate you about Chareidim because of your bias? "less likely to be correct" is not the same as "more likely to be incorrect than correct"!" Ephraim- what you said about the Haredi parties are true, they are frauds, but what you forget to mention is the Dov Lipman proposes the same thing and with Ein Atid their program and ideology can have worse results. Rabbi Slifkin: Keep up the good work! Don't listen to those who would prefer you just write on positive topics. There is nothing more "rational" than demonstrating that the Charedei viewpoint is a complete distortion of our mesorah and not the way that Yiddishkeit was practiced for the past many centuries. The Charedi world has corrupted Yiddishkeit in some ways more than reform ever did. At least the reform were honest in that they were changing traditional Jewish belief and tradition.
" but what you forget to mention is the Dov Lipman proposes the same thing"
I'm not going o defend Lipman against legitimate criticism. Call he naive, but don't cite some crazy blog who calls him erev rav. That's way over the top. I still believe that Lipman was a creation of the thugs in Bet Shemesh. I doubt that Lipman has given much thought to other issues. (For example: his comments on the mandate era Kotel) His "moderate" stance on the settlements may be simply be a corollary of his distaste of violence, a remnant of charedi distaste for the settlement project or due to influence of his colleagues at Yesh Atid. Fortunately, Lapid is more or less in agreement with Likud on security. While he may be a dove at heart, he is not so self-deluded as to be able to ignore the fact that the Palestinians are not yet interested in peace. Thus, I'm not concerned with Lipman's attitude- I don't think it matters one way or another. By the way, Lipman is a member of the "Land of Israel" caucus in the Knesset, which puts him pretty far on the right on these issues. I was actually surprised to see him there. Could be. But when you're in the opinion business and you do this, you risk losing your credibility, which damages the merchandise. In my eyes at least, that is what has happened to Jonathan Rosenblum. I would contrast this to one of his colleagues on Cross Currents, Rabbi Adlerstein, who I believe manages to present the haredi world in a better light than any of the other writers there (or just about anywhere else) by simply confronting issues head on with what seems to me a high degree of consistency and intellectual honesty, without resorting to the tricks and stratagems of legal advocacy to soften the unfavorable facts and buttress his case. I don't always agree with Rabbi Adlerstein, but I always feel that he is presenting an honest assessment of whatever issue he is dealing with, and that by doing so, he is offsetting the bad impression that many other advocates of haredi hashcacha make when they misrepresent facts to make their case, and to avoid the need to confront contradactions between facts, on one hand, and hashakafa and loyalty to the "gedolim", on the other. The whole controversy over science and Torah, or rather, between science and the insistence of many rabbis that a literal reading of sefer B'Reishit is an article of faith, presents endless examples of the latter. Thank you for writing a lucid defense of R. Dov Lipman against yet another slanderous chareidi attack. Well said! Dov Lipman is certainly a neophyte politician and has yet to learn the wily ways of more experienced liars, -ahem- I mean politicians, but I totally support his vision of integration of religious and secular spheres. This is the big issue now, with the looming Chief Rabbi debate and the Charedim (Ashkenazi and Sefardi) are blazing with all their guns (R' Ovadiah, tzelem behechal) because their bubble has burst. They'll have to learn integration one way or the other though. Dov Lipman is a member of parliment from a secular party and therefore his religious opinions are irrelevant - he is not serving in a rabbinic position. Would anyone care what Tzippy Livni's or Avigdor Lieberman's opinion on tzinius is? Someone like him causes them to be buckle down and oppose all change, even things that were already started to put in place. This sound's like Rosenblum's plea to maintain the status quo indefinitely, and let the haredim work change into their lifestyle at their own pace and discretion. The problem is that the haredi leadership and populace has lost all credibility to work towards meaningful change. Haredi educational institutions that introduce bagrut and professional training are routinely ostracized by their own leaders and newspaper editorials. And that's just the lowest hanging fruit. No one is even entertaining the idea that haredim will introduce their own programs to integrate youth into army and national service. Temujin, wow, we'll said, and the poetic emotion reveals a real mensch! Thank you. The ikkar is not to be forgotten. This is why the political tables were turned in this election. Hashem's stick to prod the Jews to become better comes in many forms (Arabs, Yesh Atid). And there will be a better 'future" because of it. I also am embarrassed and saddened by the venom coming from some persona. The years of enmity (taught in homes and schools) is fueling this eruption. But now that it is in the open, other sensible people can try to reconcile both. 1) Why did R. Lipman and the woman insist on standing next to the charedi guys, despite the police officer's repeatedly asking them to move away? It's one thing if they were just "walking down the street",(or on the other side of the street), but they seemed by standing there that they wanted to provoke some type of response. 2) True the woman's form of dress wasn't intended to provoke--but this type of crowd most definitely won't find it acceptable. Standing right next to them is provocative. 3) The charedi guys seemed quiet until R. Lipman approached them. I'm not saying that the charedi guys' behavior is such Torah-true Judaism either (it's probably more a chillul Hashem)--but I see that R. Lipman kind of enjoyed riling them up also. What can possibly be gained from that? PS I think it IS bear season in Monsey and Rockland County. > I think that it was a huge mistake for Lipman to say what he said. Um, don't Chazal say that a person can't say "I can't tan hides in the market place! I'm an important person!" but that he should accept the most menial work so as not to live off charity? I'll bet you're wondering Natan when you'll ever recover your peace of mind after spending your formative years in charedi yeshivot. The answer: never. Those people are so toxic, so arrogant that their poison gets into the bones. They are the eruv rav. Mostly they should be ignored but it's fine to attack now and again like they attack 24/7. Ephraim- one clarification he was referred to as a "spy" and not "Eruv-Rav" and if you had read the piece you would know what it referred to (spy as in the Meraglim who also spoke well yet bad against the land of Israel and how Am Yisrael shouldn't control it). First read the piece and then comment. "Ephraim- one clarification he was referred to as a "spy" and not "Eruv-Rav" and if you had read the piece you would know what it referred to"
Read it again: A commenter referred to Lipman as erev rav, and the blogger responded "...you are correct!". Lipman is by no means an important figure in Yesh Atid. Had the election outcome been slightly difference, Lipman would not have been in the Knesset. The charedim have found in Lipman a convenient straw man and let's face it- Lipman is interesting for other reasons too. But let's not overstate his influence. I don't give a darn if a politician leans left on settlements, providing they fully understand that the Pally's have no interest in peace. That understanding alone will keep the moderate left-wing from handing over land to the terrorists. So I'm not particularly concerned with Lipman's dovish inclinations. You disagree? OK. But calling Lipman a spy or erev rav is simply nasty and mean-spirited. Ephraim- again read the article and see what it meant to call Mr. Lipman a "spy" and what it was/is a reference to (to the "spy's" of the Torah). Ein Atid uses him as their spokes dummy to rally against the Haredim and Torah. They say see look at this Jew with his black Kippa etc. speaking these things. Anyway he is not a role model and someone who is willing to break Halacha like that is NOT to be trusted even if he is not influential enough (in your words). We either uphold and promote the Torah or not, stop playing games. I also heard some speak and about a number of many other issues I see him and his Americanized "Judaism" very wrong and anti-REAL Torah. Him, his party and those in the gov. today will G-D forbid introduce all sorts of abominations such as gay "marriage", deform (aka "reform") "Judaism". Fake conversions which will only divide the nation permanently and other such things. "But even would-be social engineers must know something about the human material they would mold - their culture, their history. Lipman has lived in Israel for less than ten years, yet he glibly assumes that whatever he grew up with in Silver Spring is equally applicable in Israel. If he learned math and English, then what possible valid objection can Israeli chareidim have? He cannot understand that the issue is less about math and English than it is over ceding curricular control of chareidi schools to secular authorities. The “citizenship” requirement scares chareidim a good deal more than math or English. To understand the Israeli chareidi mindset, one must first know something about the history of kulturkampf in the Holy Land, and the efforts by the government and the Jewish Agency in pre-State days and in the ‘50s to uproot religious observance among the younger generation. To understand opposition to army service, one must know something about the IDF’s traditional role as an agent of socialization to a culture that chareidim consider anathema to their values." I imagine its for the same reasons that Rosa Parks didn't just move to the back of the bus. If someone is violating your rights, then you want to take a public stand to show the world what is going on. The embarrassment over what they are doing is probably why they cover their faces even though there are policemen right there. The policeman probably doesn't appreciate that you are making his life harder, but that is not a reason to give up. The analogy in the US (which I've never encountered) would be thugs on the sidewalk yelling loudly "Filthy Jew" to people trying to walk down the sidewalk. Sure, I could remove my Yarmulke or walk on the other side of the street, but is that the right thing to do or would that be cowardly? (I'm not judging other kinds of persecution that we've faced over history where the prudent thing to do was probably to lay low). What I'm surprised about is that this is not illegal in Israel. IANAL, but while you can stage political protests and your PoV cannot be restricted, I don't think that it is legal in the US to approach someone on the sidewalk and yell at them in an intimidating fashion as a group in a loud voice, effectively blocking the sidewalk. I am VERY well aware that those positions are of certain Rishonim. But for him to use those positions, which were absolutely not those of the Yeshivos that he learned in, almost certainly not the positions he previously held, are not the positions of the Chareidim which he claims to be one of (are also not the position of the MO/YU World as expressed by RYBS and others),not mainstream for many years, IS ridiculous. It adds nothing useful to the debate and adds zero legitimacy to his argument. If you use this standard, then nothing done wrong can ever be corrected. By definition, that is not how we are doing it now and any support for change, even from Rishonim, is irrelevant, since that is not how we do it. As it turns out, some of the responders on the Charedi side are in fact admitting that the Rambam's Shita does apply today (to at least some of their own members) and there is a need to educate a significant subset of Charedim to enter the workforce. They must disagree with you. "What a sneaky, dishonest account. The distortions are so densely packed into this that it has to be fisked." "Fisk" is British slang, unknown to many of your readers. Thanks. I read yoru columns all the time and this is the first time I am commenting. Rosenblum's hypocrisy is palpable. He acknowledges the tragedy of raising generations of unemployable people ,yet defends the chareidim and keeps silent of the 'sinat chinam' that they spread. Let me also respond to the criticism of his words about a yeshiva bochur doing the street cleaning. This seesm to have been a scandalous comment, although the gemoro clearly says "pshot neveila beshup ve'al titstarach la bryios" better to skin animals in the village square (a lowly profession) rather than relying upon others. Todays' chareidim-particularly in Israel- are arrogant and are intolerant of asny other view- even if it is a legitimate view. Times change. While you are correct that there were certain strongly anti-religious elements in the government and the IDF in the early years of the state, that time has passed. It should also be noted that the Religious Zionist camp also fought against these things and the vast improvement in the IDF's attitude towards religous Jews is due primarily to their efforts by being part of the system and not standing outside of it as the Haredim do. It must also be noted that most of the anti-religious activists in the old days themselves came from what we might call Haredi families and society themselves. Almost all Jews were mitzvah observant 200 years ago. People have to ask themselves why most Jews gave it up. It must be remembered that the founder of the Soviet Yevseksia (Jewish section of the USSR Communist Party) Shimon Dimanstein which viciously persecuted religious Jews studied in yeshivot and go semicha from well-known Rabbanim. People like Rav Kook dealt with the question in great depth. Others simply attribute it to a group of reshaim "suddenly" coming out of Am Israel. I find this latter approach very superficial. Rabbi Slifkin: You will love this post! >>> "Fisk" is British slang, unknown to many of your readers. Thanks. Fisk in perfectly well known to American English users. it means a point-by-point repudiation of an others document. Of course, throughout history there were more observant and less observant Jews. There were, of course, dissident groups like the Karaites, but they generally formed separate communities. However, since the communities, before the French Revolution were semi-autonomous, education was along traditional lines for everyone and social pressure made almost everyone conform to at least outward religious observance. The Reform movement began about 200 years which allowed large numbers of Jews to formally abandon observance. However, most Jews accepted tradtional beliefs and practices. David Ohsie likened R. Lipman's behavior to Rosa Parks'. That video was taken almost two years ago. What's the situation now? Are things any better as a result of this activism? I think most secular Jews would find this situation baffling. What is exactly going on here? And the comments above discuss many more issues than that of the modesty of the women walking down the street. From a secular point of view the women and young girls walking down the street looked quite modestly dressed. But apparently the Haredim feel that they are not modestly dressed. Is this directly related to Haredim getting a secular education, enlisting in the IDF, and entering the workforce? As far as the dress is concerned, isn't there some way to address this issue in a way agreeable to all parties? I agree with you that the time has come for a change. My point is simply that the reason for chareidi reluctance to join the IDF is not just because they don't feel like it, they don't care, they're lazy, etc. It also relates to the fact that the State of Israel was founded with deep conflicts between chareidim and the Zionists woven in to the very fabric of society - the points made by YR. In order to have an intellectually honest discussion of an issue, you can't just address your opponents' bad arguments! I just want to qualify and say that I was not comparing his level of courage or even the urgency of the cause. Rosa parks is justly celebrated many levels above R. Lipman which is no insult to R. Lipman. However, the tactic is valid, just and can be effective. The chareidi mayor of Bet Shemesh was all for giving in to the zealots and removing the school from the dati-leumi population that it had been promised for. The only reason why the dati-leumi community was able to keep their school - and that the protests eventually died down - was that they took a strong stand and did not give in to intimidation. But does it really matter when judging whether his actions were justified. Not every principled stand succeeds. As for the charedi guys covering their faces--it could be they didn't want to look at the woman. Watch the video. They are turning from the camera. I would not stereotype and claim that anyone not in the video supported them, but the actions of those in the video and the many videos like that are clearly very wrong and I believe anyone who strips away the politics would agree (e.g. if you saw this happening in another country). I admit that this is not something that I cannot prove. There is a problem of a woman passing between two men, etc., that's mentioned even in Kitzur Shulchan Aruch. I admit that they're oversensitive to that, but I think it's more proper to respect their feelings, than taking this in-your-face stance against it. People can take that on as a Minhag or Halacha. But then they should not be standing around on two sides of a public sidewalk! If they took it seriously, they would get off the sidewalk and stand to one side of it when they need to be on it. "Fisk" is British slang, unknown to many of your readers. Thanks." Can you reprint here R. Lipman's response to Rosenblum? henersw "I think it's more proper to respect their feelings, than taking this in-your-face stance against it"
Yehuda P.--More respect for guys who spit, throw feces, and call little girls whores? Seriously? "-More respect for guys who spit, throw feces, and call little girls whores? Seriously?" You're right, these guys are the most militant of the group--their actions are a chillul Hashem, and they're justifications for their antics are also disgusting. But there isn't any other way to stop them, like by appealing to some rabbinic authority that they'll respect? 1) At demonstrations to close Bar Ilan street on Shabbos, Meretz people were purposely driving their cars back and forth, just to demonstrate their "right" to keep the street open. It's not like they needed that street to get to where they had to go. In these two instances, my sympathies were with the charedim, even though I myself didn't go to protest, and I found the leftists' in-your-face antics disgusting. Are my sympathies misplaced? I personally dont see much difference between the flat hat haredis who spit at girls and Natan who proudly posts a picture to the whole world of his bat cage with the lining being a picture of Harav Ovadia shlita so the bat dung can fall on him. Natan, all your spin to the contrary will not help. LOL. Um, actually, you're the one doing "spin." It wasn't "so that" the bat dung could fall on him - I didn't even notice that his picture was there until later! I think that you should embark on a campaign to save the honor of the Gedolim. After all, in Israel, every single person who owns birds lines the cages with newspaper, and the streets are full of discarded free newspapers that are full of pictures of Gedolim. It's an inevitable problem! 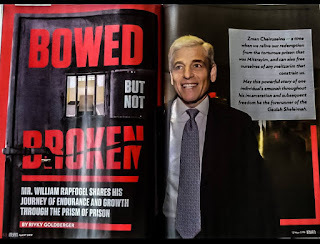 By the way, given Rav Ovadiah's appalling diatribe against Rav Stav this week, I think that his picture in a newspaper in a batcage is the least of the problems with his kavod at the moment. 1. Attempts to delegitamatize Jonathan Rosneblum by saying, "he's writing for his audience" are foolish. Every coloumnist in the world could be attacked this way, as could every politician, every rabbi, and every speaker. It's just a way for readers to convince themselves that JR could not possibly mean what he says, even though, in fact, he does. 2. He's 100% right in what he said about Lipman. In fact, I said the exact same things, on this blog, when the videos first came out. [RNS surpressed a few of my comments, though possibly it was off topic, though I dont think so.] It is obvious beyond obvious Lipman was trying to provoke the Charedim. At the time I thought he was just another guy who likes to stir up trouble, of whom there's no shortage. It was only in retrospect that we saw it was a publicitly stunt for politics. 3. Lipman view's on charedim and the draft (and by extension, unemployment) are widely held by many religious Jews, including probably all of the RCA laity, and a pretty big chunk of the Agudah's. But his support for the feminists at the Kotel is a game changer. The draft is merely a question of getting charedim, naturally conservative, to adapt to new social conditions. That takes time, as it always does, but it will eventualy happen. There is no reason Charedim cannot fight or work. Supporting feminsim, on the other hand, cuts at fundamental notions of tznius, which the Charedim will never tolerate. [Rightly so, I would add personally.] It was foolish of Lipman to wade into those waters, and reveals a great deal of what he's become. 4. The problem here is Lipman and his "look at me!" personality. Yair Lapid, a total outsider to religion, thought a guy in a beard and black yarmukle would insulate him from Charedim [about as wise as the GOP thinking a black secretary of state would insulate them from black demagougues.] But Lipman has proved to be a buge liability, and not much of an asset, except to distract angry charedim from attacking the agenda, and focusing them on a guy. Parties with big overnight gains usually lose in the follow up elections, and Lipman wont he high on Yesh Atid's list. 5. For that reason, the charedim should not waste their energies on the clownish antics of Lipman, who in all likelihood will not be in the next Knesset anyway. Their efforts are better spent on the overall agenda they oppose, and not on the lightning rod. West Orange, I know this is the internet, and that you are anonymous and that these two things lead people to post odd content. But could you do me a favor and rethink that sentence? For the sake of argument, let's posit that R. Slifkin's post was disrepectful (his position is different, but it is not important for this discussion). Do you really think that a group of young men standing on the street assaulting verbally and physically (spitting) women and children is really the same as a disrespectful internet post? And people that they are assaulting are Shomrei Torah! They also don't drive on Shabbos, pray 3 times a day, etc. Besides the assault, do you not see the the amount of Sinas Chinam that is being expressed and also generated in others, as well as the Chillul HaShem to see people who are Shomer Mitzvos openly doing an such horrible Aveirah in public? Again, if I grant your argument that R. Slifkin's post was disrespectful, how does that support your argument? All groups in all parts of the world including your group and my group sin all the time in much worse ways: they generate and repeat Lashon Harah, don't always give their families enough attention, say tefilah without Kavanah, etc. Since I've now shown that we're all such extremists, I suppose that we can't protest Hamas? (Note to literalists: street thugs in Bet Shemesh not equal to Hamas. This is a reductio ad absurdum, not an analogy). Why do you think ROY's comments were appalling? Is Rabbinic Judaism really very tolerant? ROY called someone out using halachic terms. He didn't call him out on personal allegations, he called him out in halachic terms. Shouldn't be very different than calling a mechallel Shabbat or a heretic a rasha. They can be nice, honest, and even God fearing, yet the halachic classification stands. There is knee jerk reaction that demands that Judaism always be tolerant, which is difficult to accept. 1. Attempts to delegitamatize Jonathan Rosneblum by saying, "he's writing for his audience" are foolish. True, but observing that he's deligitimized himself by his other falsehoods is neither foolish nor irrelevant. It is obvious beyond obvious Lipman was trying to provoke the Charedim. It looked that way to me, too. Of course, I can't claim to know his intentions with certainty, but more to the point, why would a couple of minutes of immaturity make his other ideas irrelevant? Their efforts are better spent on the overall agenda they oppose, and not on the lightning rod. No, their energies are better spent developing a sustainable society with responsive and responsible leadership. Moishe - I agree with your second point, and dont think his inanity makes his ideas irelvant. Actually I dont think he personally has added any ideas, his platform is the same as his party's, some of with which (the draft) I agree, and some of which (the feminism) I dont. But that's just me. Others will indeed be offput by his buffonery and juvenile antics, and will be swayed from the message because of the messenger. Point three I also agree with, I was speaking alibeh dideh. Point one I cannot agree with. I respect your view, but Rosenblum himself clearly felt that the truth wouldn't support his conclusion. I am a little disappointed that he then chose to mid-state things, but partisanship is a powerful force. In the 2:40s part of the video provided by Rabbi Slifkin a Chareidi has his arm around Lipman. There was a cameraman available before Lipman and the woman came. In the video early on you see a camera man patting the back of one of the Chareidim. If there is any fear to be met with I think I will have to look further on in the video. Moishe, where do you see that JR clearly felt the truth wouldnt support his conclusion? As a distict second q, where do you see JR lying, period? I've read JR's article, and Lipman's rebuttal, and frankly I'm not convinced by the latter. To the contrary, he comes across as slippery and as evasive as any other politician. He labels opinions of JR as "falsehoods." He runs away from the hard problems JR raises, and I cant see anyone not already in the choir being convinced by his defense. I reiterate, some (most) of his party's platforms I agree with. The problem is Lipman himself. It would be one thing if he delivered votes for the party. People like that are very useful to their bosses, and the fact that they infuriate their opponenets is even an asset. But Lipman's a liability, without bringing anything to the table. He personally has added no ideas, no peacemaking, no votes, no bridge building, no nothing. All he has done is brought shame and contempt upon himself. Yes, he has gotten himself elected to the current knesset in the process. mazel tov. regarding "Sleeves albeit above the elbow is just as forbidden as a mini-skirt." Ari - see Rabbi Yehuda Henkin's "Understanding Tzniut." Padon my cynicism, but doesn't Jonathan Rosenblum get paid for his articles? If so, then he has to conform to his host's biases if he wishes to sell his wares. Guess, what kind of article Yated will publish.
" He's 100% right in what he said about Lipman. In fact, I said the exact same things, on this blog, when the videos first came out. It is obvious beyond obvious Lipman was trying to provoke the Charedim. At the time I thought he was just another guy who likes to stir up trouble, of whom there's no shortage. It was only in retrospect that we saw it was a publicitly stunt for politics." On this point you are 100% wrong, and actually have it 100% backward. Neither Lipman (nor any of the those forced to go out twice daily to protect the kids) were the instigators. Lipman was not "stirring up trouble". The chareidi mob was instigating and stirring up trouble, with the acquiescence and silence of almost the entire Israeli chareidi world. I lived right there in the epicenter of where the chareidi mob was attacking kids. They, along with some residents of that block, were throwing rotten eggs and feces, and terrorizing kids by screaming at them, on a daily basis for months on end. (These incidents were documented on video and given to the police, who did nothing about it.) My kids were attacked more than once, as was I.
DF - you need to do some serious fact-finding and research. Parents and neighbors were forced out to protect the kids, because not one was willing to help: not a single local chareidi rabbi was willing to even condemn the mob and their actions, the mayor did nothing, and the police did nothing - for a very, very long time. We were forced to protect our kids by walking them to the bus and providing cover for when the rocks were thrown so we could get hit and not the kids. We had to hold their hands to ensure the kids felt safe from the threats and terror perpetrated by the chareidi mob. DF - you need to do some serious fact finding, because if all your other points are as accurate as that one statement about the incident in Bet Shemesh last year, you clearly have no basis in truth or reality. jeffk said,"not a single local chareidi rabbi was willing to even condemn the mob and their actions, the mayor did nothing, and the police did nothing - for a very, very long time." Thanks for that clarification--it speaks a lot more than a four-minute Youtube video. That's quite a shock--if a person just raises his hand to hit someone, he's already possul to be a witness. I guess they reason that that doesn't include throwing things. Who gives the guys who resort to force (spitting, rock/egg/feces throwing) such backing? Not halachah, and certainly not the law. What are the rabbis afraid of? And what are the police afraid of? DF - sorry for the delayed response. I was referring to Jonathan Rosenblum's description as the woman walking past a shul in a Yerushalmi section of town. I believe both of those statements are inaccurate, and I can't see why someone would feel a need to shade the truth if the truth supported his arguments. Does the apology appear in Yated, or just on Cross-Currents? 1) It was baseless slander and thus unethical. 2) It resulted in a loss of credibility and distracted from his larger attack on Yesh Atid. I know this is insignificant, but it's also an אסור דאורייתא. A tiny concern for someone fighting for God's glory against the evil Women of the Wall, and the impudence reflected in their refusal to defer to him and his selected leaders, but one worth noting nonetheless. The obligation of a woman to cover her arms and the obligation of a woman to cover all (not just part) of her hair is a matter of "Da'as Yehudis." (Kesubos 72a-b) Meaning it depends on the customs of tznius of Jewish Women in a given community. Therefore among the Dati Leumi community where short sleaves and hats are common such attire is tzniusdik. This is a bit late, but I just ran across this quote. Looks like JR once thought better of Dov L.
What is so evident to me as an outsider to the zealot community is not, however, necessarily so to one dwelling within. That is why I was so heartened by a newspaper account sent just before the High Holy Days of how Rabbi Shmuel Chaim Pappenheim, a former editor of the Eda Haredit publication Der Yid and a resident of Beit Shemesh, publicly condemned the demonstrations against the school, apologized in print, sought forgiveness from Rabbi Dov Lipman – a leader of the defense of the Orot school – for previously written harsh words, and reached out to Lipman for dialogue.